Nifty opened weak and stayed weak throughout the day, with close coming at the lows at 5676, a huge loss of 70.95 points. It went down as in a trend day with no buying seen at all. 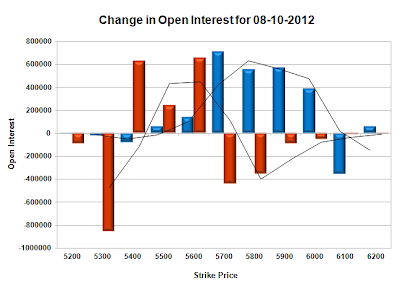 The OI Table saw makeover with support shifting down to 5600 and solid resistance coming up at 5800. Call option 5500-6000 added 24.14 lacs huge amount of OI, with small profit booking seen at 6100 and above level. Put Option 5400-5600 added 15.24 lacs huge amount of OI, with huge liquidation seen at 5700 and above strike prices. Highest accumulation on Call option 6000 at 71.1 lacs & 5800 at 70.1 lacs whereas Put option 5600 at 61 lacs & 5500 at 58 lacs. 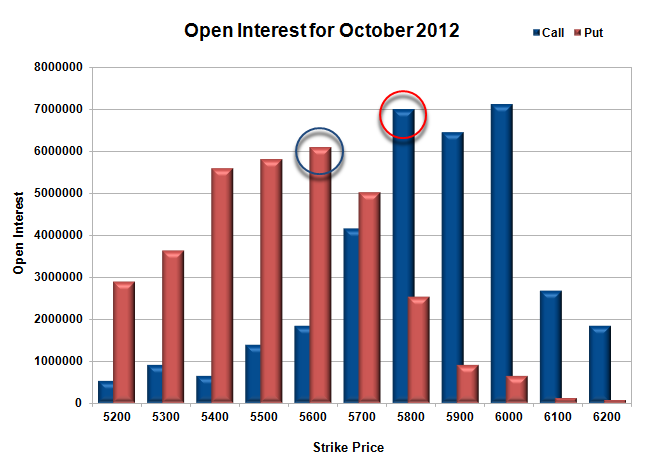 Nifty Open Interest is at 2,63,26,100 down by 76,650 with decrease in price, most probably small long liquidation. Bank Nifty Open Interest is at 10,92,800 down by huge 56,625 with decrease in price, most probably huge long liquidation. FII’s bought huge 4.39 lacs of Futures, most probably long build-up as their Net OI also increased by 7.54 lacs, and their average price per contract comes to around 5516. FII’s future open contract as on date is 5.882 lacs. PCR Open Interest (Volume) is moving down fast and just above 1 at 1.031. Support now at 5600 highest OI on the PE side at 60.96 lacs and below that at 5500 with OI of above 58 lacs. Initial resistance at 5700 with huge addition for the day at 7.1 lacs and above that at 5800 with huge OI of 70.1 lacs. 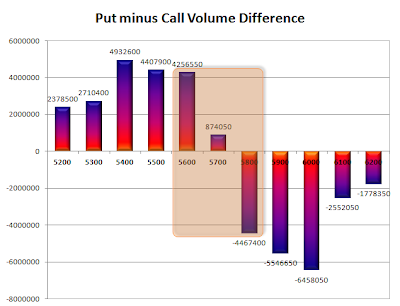 Range as per Option Table is 5645 -5742 and as per VIX is 5625 - 5727 with 5700 as the Pivot.